The Zinc Anode is a replacement part for our marine-capable floating fountains. The sacrificial anode is designed to protect the metallic components from corrosion in salinated and brackish water. During the "electrolytic action" created by the salinated water the anode "sacrifices" itself in an act known as "cathodic protection" as it reacts faster than the steel parts inside the pump and body of the fountain, keeping your equipment performing to the best of its ability for longer. 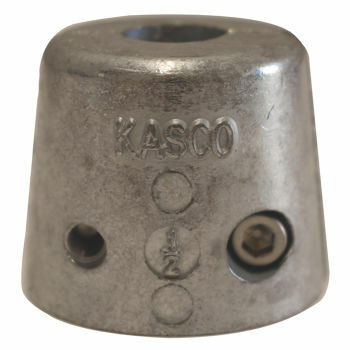 The anode mounts directly onto the propellor shaft and is quick and simple to replace. Two hex key bolts secure the two halves together allowing it to clamp onto the shaft. The Zinc Anode must be inspected every 3-4 months for corrosion and must be replaced every year or when it reaches 50% of its original mass.